Treasury Department places two top figures in Yemen's Houthi rebellion on its sanctions blacklist. The United States on Tuesday placed two top figures in Yemen's Houthi rebellion on its sanctions blacklist, following suit after the United Nations approved global sanctions on the two, AFP reported. The Treasury Department named Houthi leader Abdul Malik al-Houthi, and leading backer Ahmed Ali Saleh, son of former president Ali Abdullah Saleh, to its blacklist, the report said. Any assets the two might have on American property will be frozen and Americans will be forbidden from dealings with them. "Using violence and other means, Al-Houthi and Saleh continue to undermine the political process in Yemen and obstruct the peaceful transition of power," the Treasury said, according to AFP. It said that the international community has stressed through the UN Security Council's action "that the violent takeover of Yemen by an armed faction is unacceptable and that a legitimate political transition -- long sought by the Yemeni people -- can be accomplished only through political negotiations and a consensus agreement among all of the parties." 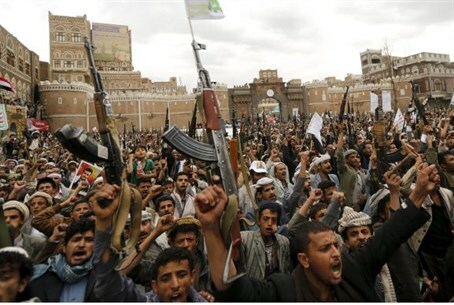 The action follows the move by the UN Security Council earlier Tuesday slapping an arms embargo on the Houthi rebels and demanding they give up territory seized in an offensive that forced UN-backed President Abd-Rabbu Mansour Hadi to flee the country. The UN move also placed a global travel ban and asset freeze on the two men. Saudi Arabian airstrikes have had some effect in blunting the offensive by the Houthis, who most recently seized control of the strategic port city of Aden, but they are far from defeated and still remain the strongest force on the ground. Iran has threatened that Saudi Arabia’s foray into Yemen would end up costing it dearly. The Saudi “aggression,” said Iran's Foreign Ministry, would “complicate the crisis in the country and kill opportunities for peaceful resolution of the crisis in the Arab country. The smoke of the war in Yemen will reach the eyes of the Saudis."